Our Atlanta Real Estate team is growing quickly. 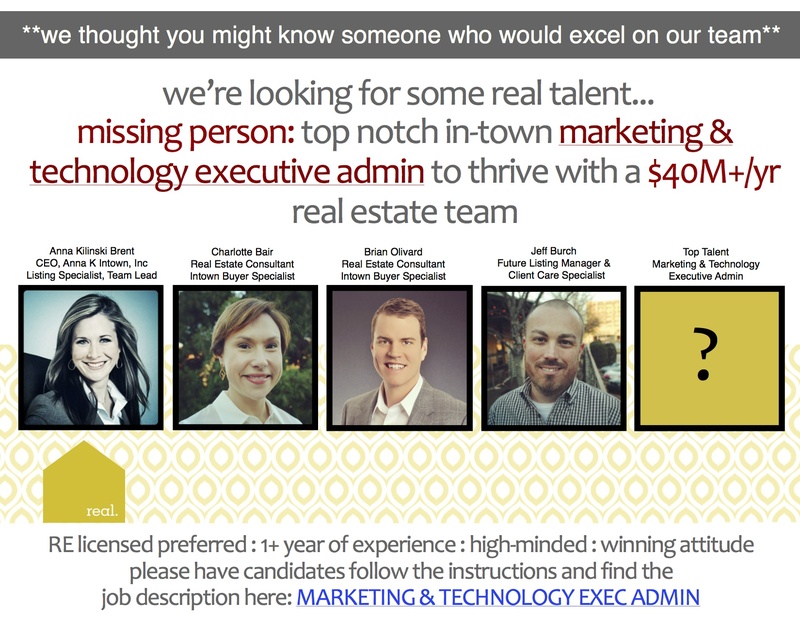 We are seeking a marketing and tech savvy Administrative Assistant for the #1 KW Intown Atlanta Team. 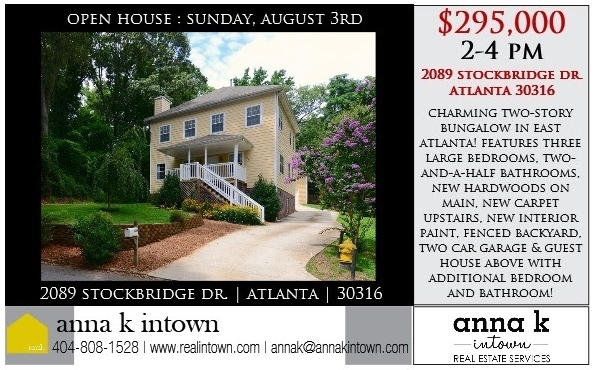 Anna K Intown, Inc, a real estate services team associated with Keller Williams Realty Intown Atlanta serving residential home sellers and buyers in the “In-town” Atlanta neighborhoods such as Candler Park, Lake Claire, Inman Park, Ansley Park, Virginia Highlands, Morningside, Druid Hills, Decatur, Cabbagetown, Reynoldstown, Grant Park, Midtown, Old Fourth Ward, etc, is currently seeking an experienced professional for the initially hourly then salaried with opportunity to earn bonus, early-career position of Marketing & Technology Administrative Assistant. Build, implement, and manage or oversee all systems for goal setting/tracking, sellers, buyers, leases, lead generation, lead tracking, team marketing, database management, social media management, website updating & management, information management and back-office support. The Marketing & Technology Assistant is an individual who is willing and able to earn the right to be an Assistant Executive. This person relishes the opportunity to build, implement, and manage multiple systems. The Executive Assistant is deeply committed to completing tasks the right way with a high degree of quality and ownership. This person has immense focus and can do one thing for a long time without getting distracted. This individual may exhibit some drive and desire to influence; however, the overriding marker of his/her behavior is persistence, quality of completion, ownership of task and stability. An Marketing & Technology Assistant is deeply committed to supporting the lead agent and other team members in achieving greater and greater levels of success, and to growing his/her own skills and developing into a supportive leader within the team. As the success of the team grows, this individual will be responsible for hiring, training, and leading additional team members to ensure all administrative tasks of the lead agent’s business continue to be completed to high standards with maximum efficiency. Microsoft Office Excel (working with formulas), Word, Power Point, Mac & WindowsOS, Database Management, Contact Management System Management, Social Networking, Quickbooks, Microsoft Publisher and/or Mac iWork Pages, Web Page Management, proficiency in WordPress (Blogging & Website Management), social media platforms and required to learn other real estate related software (FMLS, GAMLS, etc) and marketing programs as needed. Design software knowledge is a plus. Some weekend & evening work will be required to support team as needed. Must have full time use of reliable vehicle. Real Estate License Preferred but not Required. Must live “in-town” Atlanta for reasonable commute. · High level ability to follow up with leads, return calls, make calls, and verbally communicate with clients, agents and prospects. The position will provide support for all business operations. Ideal candidates will be experienced executive assistants with emphasis on marketing, technology, entrepreneurship, or real estate or recent graduates looking for a challenging entry level position. PLEASE NOTE: DISC profile MUST accompany resume or candidate will not be considered for position. The Anna K Intown Team. 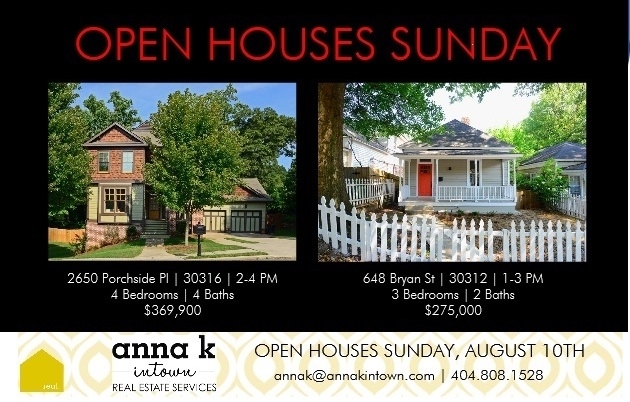 OPEN HOUSES THIS SUNDAY! 2650 PORCHSIDE PLACE IN EAST ATLANTA & 648 BRYAN STREET IN GRANT PARK! COME AND SEE US! OPEN HOUSE THIS SUNDAY FROM 2-4 PM! 2089 STOCKBRIDGE DR IN EAST ATLANTA!